Taken with Olympus E500 digital camera January 20th 2007. Click image for larger view. 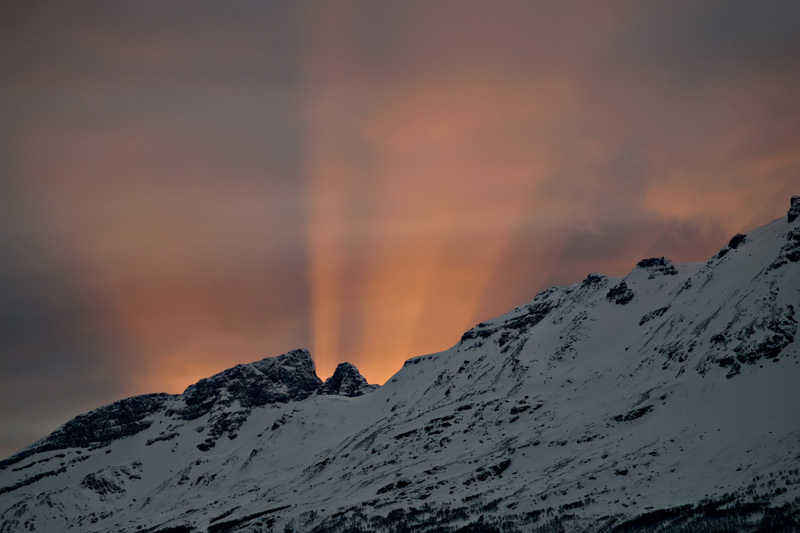 In this photo you can see sunbeams coming up from a mountain. It is the only time I have seen sunbeams shine the “wrong” way and I was wondering what was hiding behind those mountains. As you can see by all the snow in the mountain, this picture was taken back in January (actually 3 days after I got my sweet camera) and at this time of the year we have no sun up here in northern Norway. The days are not totally dark (referred to as Polar night) as we have twilight in the middle of the day, but the sun is gone for several months. When the sun comes back in the end of January we use to celebrate and think about warmer times that includes midnight sun. Do you think you could live in a place where there is no sunshine for several months? For other pictures of the same mountain check this one and this one. Beautiful photo. This one would make a great desktop wallpaper – love the colors and the way mountains “stand out”. It’s almost like a 3D picture…awesome! Love the pic. The sunbeams hanging on the orange sky are fantastic. Hey is there a way I can sign up for a membership to your blog? I don’t see a sign up anywhere. Keep up the good work. Mr Olsen: Takk kommentaren og besÃ¸ket. Jeg leser bloggen din i RSS readern. Skal bli flinkere Ã¥ kommentere! Whats the benefit of signing up? Beautiful and kind of mysterious too. Maybe because it is so foreign and different from where I live (in south Florida). It’s a lovely photo, Thomas. It looks quite apocalyptic. It must be quite strange having so little sun for so long; I can imagine why you would celebrate the return of the sun. Fantastic image, with regards to living in a place with no daylight for months, then |I would say no I couldn’t,I think I would go off my head. Very nice i must say! WHat is the specs on your lens, if i may ask?